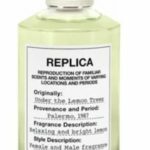 You could get a FREE Maison Margiela REPLICA Under the Lemon Trees Perfume from Viewpoints. This perfume was inspired by the memory of a sunny escape in the countryside, this fragrance evokes a nap under the trees in the park of an old villa, where fresh scents of cypresses and lemon trees float on the balmy breeze. To see if you qualify, just fill in the simple survey.